every practitioner, no matter your experience or fitness level. Aerial Vinyasa introduces students to the Aerial Yoga hammocks and the general flow of an Aerial Yoga class while you explore a repertoire of poses and transitions. You will learn about breathing, mental focus and safety measures used in Aerial Yoga class as well as become comfortable with being suspended off the ground and inversion. You will experience the peace, tranquillity, exhilaration that aerial yoga can bring your practice for the first time as you meditate, stretch, “fly” and find your centre in the incredibly healing floating Shavasana. Suitable for all levels. Aerial Silk Hatha introduces students to the Aerial Yoga silk hammocks. You will explore a repertoire of poses. You will learn about breathing, mental focus and safety measures used in Aerial Yoga class as well as become comfortable with being suspended off the ground and inversion. You will experience the peace, tranquillity, exhilaration that aerial yoga can bring your practice for the first time as you meditate, stretch, and “fly” and find your centre in the incredibly healing floating Savasana. Level: Total new aerial yoga beginners are encourage to go for 2-4 Aerial Vinyasa classes before attempting Aerial Silk Hatha. Aerial stretch introduces students to the basic general flow of an Aerial yoga class. The class focus on stretches with the helps of the Aerial Yoga hammocks, exploring the possibilities of poses that can assist or increase the intensity of your stretches. Suitable for beginners. 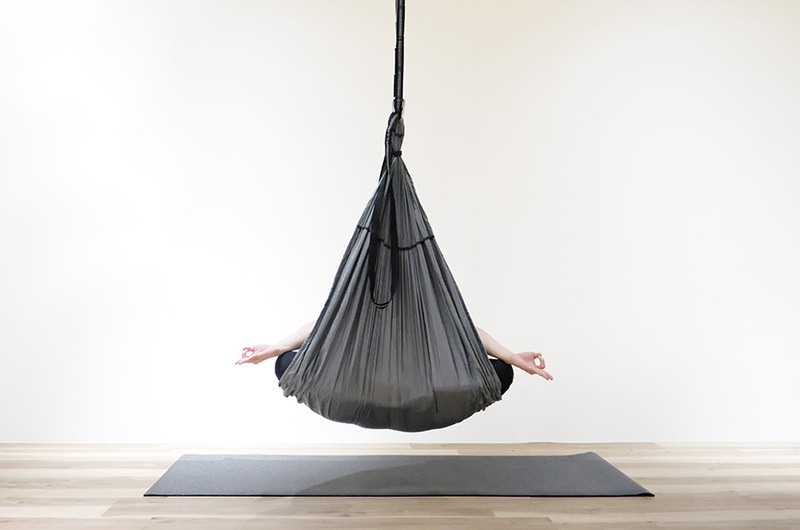 Aerial Yin and Restore introduces yoga poses with the assist of aerial fabrics, blocks and bolster. Yin yoga consists of a series of long-held passive floor poses that aims to release fascia and improves joints flexibility. It balances our internal organs and improves the flow of ‘chi’ and pranas. Restorative yoga will also be introduced to de-stress an individual. It allows complete relaxation and rest. Sound and Aromatherapy may be used in class. This class is suitable for all and pre-natal friendly. Core is a core-based flow practice. The class is structured to build your core strength while you explore a repertoire of poses and transitions. Be prepared to flow, play, and experiment with your practice and you will walk away feeling strong, refreshed and energized. Suitable for all levels. Flex Flow is a flexibility-based flow practice. The class is structured to increase mobility and flexibility. Flow is designed to help individuals with their overall strength and flexibility. Mainly focus on front and center splits. You will walk away feeling stretched as the class work on going deeper stretches with the complement of strength training that helps in all kinds of splits. Suitable for all levels especially individuals who would like to work on their splits. Gentle flow is a non vinyasa-based class that focuses on static postures and longer holds that flows in each asana. With a focus on developing mindful awareness in every asana, as well as in the breath. Suitable for beginners. Hatha is perfect for newcomers to yoga, introducing to them the basics of breath and alignment in a safe and supported environment. These classes allow beginner students to build a solid foundation from which they can deepen and explore the practice. Suitable for first-timer. Hatha 26 consists of a series of 26 powerful posture that is designed to warm the whole body, allowing students to work deeper into the muscles, tendons, joints, bones, glands, ligaments and organs while systematically moving fresh oxygenated blood to every part of the body. Performing the same sequence each class ensures you will receive a safe and consistent practice. Over time, the students learns how to focus the mind and breathe allowing them to practice deeper while remaining calm and balanced. Suitable for first-timer. Multi-level class. Iron Flow is a dynamic and challenging flow practice with weights. The class is structured to build strength and foundation with weights of your choice while you explore a repertoire of poses and transitions. Be prepared to flow, play, and experiment with your practice and you will walk away feeling strong, refreshed and energized. Suitable for all levels. 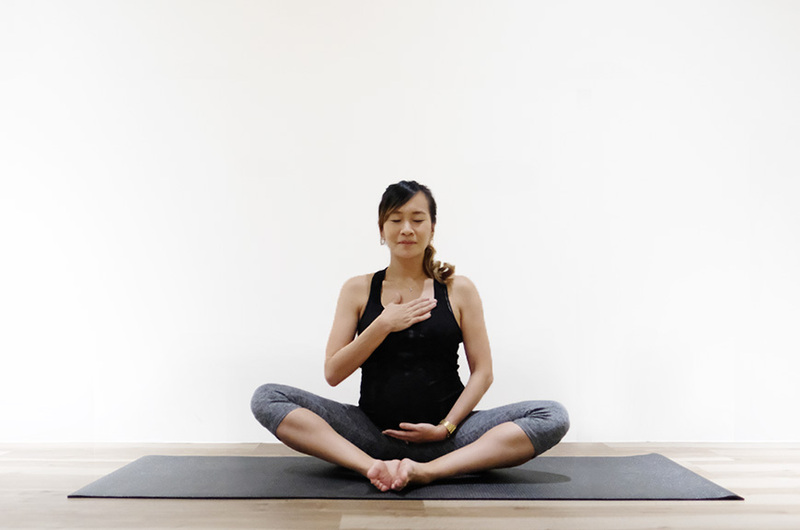 Pre-natal yoga is a unique yoga experience, incorporating yoga postures and breathing techniques to help alleviate discomforts, and stress relief. Expect to flow through a series of standing poses, followed by restorative floor work designed to open and strengthen the muscles, which are essential for labour and postnatal recovery. Vinyasa Flow is a dynamic and challenging flow practice. The class is structured to build strength and foundation while you explore a repertoire of poses and transitions. Be prepared to flow, play, and experiment with your practice and you will walk away feeling strong, refreshed and energized. Suitable for all levels. Designed specifically to open up tight backs and shoulders in back bends postures. Assist in enhancing your flexibility as well as inversion and balancing poses with the use of a yoga wheel. Suitable for all levels.